The Singapore Zoo officially turned 40 years old last Thursday and di-di & I were invited to its Birthday Bash! Singapore Zoo first opened its doors to visitors on 27 June 1973 with a collection of 272 animals representing 72 species. Today, she has a collection of over 2,800 animals of over 300 species, 26 per cent of which are threatened. More importantly, the Zoo has grown from strength to strength and established herself as one of the world’s finest, not only for her unique collection of animals and immersive exhibits, but also for her leadership in conservation, education and recreation. So it was fitting that a huge celebration was thrown in honour of one of Singapore's best well-known attractions. As with all Birthday Bashes, there were lots of roving performances and activities to keep all guests occupied and happy. Ayd ascertaining if the puppet bird is real - by attempting to pluck out one of its feathers. Glitter Tattoo Art - a sure-fire hit with the kids always. And what's a celebration without the real stars of the Zoo right? So the orangutans too came along as VIPs of the party, complete with a humongous fruit tower as a treat. From left: Ah Meng's granddaughter Chomel, with her son Bino, alongside Ah Meng Jr (middle), Anita and her yet-to-be-named son. We even got to pen our Birthday wishes for the Singapore Zoo! As an added bonus, Daddy brought us to the Frozen Tundra after the Birthday Celebrations which was recently re-opened after a long period of renovations. Built to resemble the arctic habitat, the Frozen Tundra has a cool temperature, an ice cave with a waterfall, and a large pool filled with giant ice blocks... with igloos for us kids to explore too! But the star of Frozen Tundra is undoubtedly Inuka, our locally-born polar bear. And compared to the previous polar bear enclosure, the new viewing enclosure is larger, airier and can definitely accommodate more people. Though I have to add that it is best to go during Inuka's token feeding sessions at 10am, 1pm and 4pm if you want to see him in his most active self. Else, you may just have to make do with his rear view. Well, at least we got to see him chilling in his icy cold cave. Plus there were lots of informative panels throughout the air-conditioned tunnel for di-di and me to read as well. Inuka also has new neighbours in his new habitat too! Pom and Poko are raccoon dogs from Japan while Boris and Ivana are the fearless wolverines. And no, they are not part of the X-Men. Not yet anyway. Armed with sharp teeth and claws, wolverines are the largest member of the weasel family. And they make good sentries too. But what is certain is for the entire month of July, Singapore Zoo wants to go WILD with you and what better way to do that than to offer all Singaporeans and PRs 40% OFF Admission Prices! That's right, Adults pay $13.20 (U.P. $22) while Kids pay $8.40 (U.P. $14)! 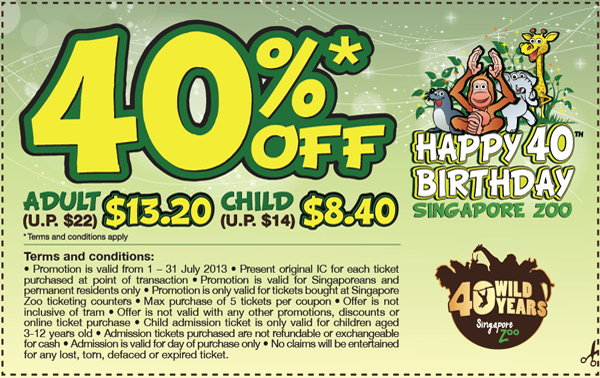 Just print out and present the coupon below at the Zoo ticketing counters from 1-31 July to enjoy this amazing deal! In addition, visitors can take part in the 40 Wild Years Trail, and redeem retail and F&B offers upon completion. The trail will run from 27 June – 31 July 2013 and consists of five questions that will take visitors to some iconic sites within Singapore Zoo. Activity sheets will be available at all Singapore Zoo ticket counters. To keep your yourself up-to-date with all of Singapore Zoo’s 40th anniversary celebrations, visit zoo40.zoo.com.sg, or www.facebook.com/wrs.sg.